One of my favorite household stockpile items is dishwasher tabs/liquid. Over the last few years I have been able to score boxes of dishwasher liquid/tabs for around 50 bents a box. Those deals are now few & far between. I have said in the past that as soon as I use all my dishwasher tabs/liquid I will start making my own. The barrel has dried and thus….. I shall make my own to save my family money. I have spent the last month perfecting this recipe to suit my own needs. It’s not rocket science, I promise!! Mix all items together minus the White Vinegar. You can either mix together then add to your container of choice or add directly to the container of choice then shake. Very simple! Each dish-washing load will need appox. 2 tablespoons on home-made dish-washing detergent. If you have “hard water” you may need to use less Borax in your recipe but the Lemishine is an additive for dishwasher machines that can help w/ users who have “hard water” plus it gives the lemonade scent. Use 2 tbsp of White Vinegar as a rinse aid (or just fill to the top of your rinse aid section) to have your glasses come out sparkling clean. This complete batch cost me $11.06 to make. Adding the LemiShine versus “koolaid” increased the price a tad, but it was worth the extra spending cost in my opinion. Each batch is equvilent to 100 loads. I can make 5 batches (500 loads) if I were to use the complete $11.06 (after taxes). That’s right 500 loads for $11.06!! If you washed 1 load of dishes in the dishwasher per day, you would have 15 months of detergent for $11.06!! Or you can use any left over product to make other DIY Cleaning Recipes. Adjust recipe depending on your water source. Use a tight fitting container and never use a container from a different type of cleaner. Label & store is safe place. In case your unsure about using Borax in dishes, 20 Mule Team Borax is 100% natural mineral from the earth. Once removed from the ground it is washed, dried, & boxed for consumers. Borax is the common name for sodium tetraborate: a natural occurring substance produced by the perpetual evaporation of seasonal lakes. Absolutely nothing is added. no phosphates, chlorine, or other additive chemicals. Borax is suggested to boost your cleaning power & can be used as an additive even if you are currently using a specific dishwasher detergent instead of making your own. I noticed no difference in quality. No spots or residue on my glasses or dishes. In fact, my daughter did not even know we made the switch after the initial test run because there were no clumps let behind as we had anticipated. I would love to start by trying the dishwasher detergent as well. I have tried toothpaste in the past! The Lemishine was about $2.50 or slightly more at my local walmart. I find that it is better for the recipe & the glasses are spotless. Worth the extra money to get that in my opinion.! I found citric acid in canning area of my grocery store. Citric acid is the agent that makes the lemonade kool-aid work, but does not stain the soap cup yellow. It increases the price overall, but I don’t want to stain my dishwasher. WOW, this is something I never even considered making myself. Even with the assurance that Borax is safe, it just seems like it wouldn’t be. Of course, I don’t know what else they put in the kind I buy at the store. I’ll be thinking about this one. wow! I would have never thought to make my own. It gets pricey. Can you make it w/o the LemiShine? You can but depending on your water, it may be worth the extra $$. Heavens–30 Mule Team Borax is still around!! I remember that from when I was a little girl!! Just goes to prove that the best products stand the test of time. Interesting. As of lately I have been looking for “greener” alternatives to cleaning around the house. I had heard of using Borax for washing laundry but where can you buy it , other than online? I would love to be able to make Dryer sheets without dyes or scents! I use 1/4 cup straight white vinegar in the water softener dispenser of my HE top loading washer. I also use the homemade laundry liquid soap. Our clothes come out very clean and only smell “clean”, not vinegar-y smelling or perfumed. From whites to cottons to polyester to towels and sheets, it works so well I will never go back to store-bought. I am also trying the borax/washing soda mix in the d/w tonite. Can’t wait! 15 Months of detergent for $11?! That’s a deal! I’d love to know how to make inexpensive dish soap…I know you can normally pick it up at the store fairly cheap, but the problem is, sometimes I run out and I can’t get to the store that night. It would be great to know how I could make some to use until I could get out to the store! BB uses Borax for oh so many things! Laundry,flea killer (on carpets), cleaning… would ♥ 3 free boxes- gracias!!! That dishsoap sounds wonderful. I will be using the vinegar in the rinse thing in my dishwasher. I plan to recreate your recipe as soon as my stockpile is gone! Oh and laundry detergent – we go through tons of that. I’d love to use it to make laundry detergent. Thank you! I’m going to give this a try. I was planning on purchasing more dishwasher tab this weekend, but I honestly think I will try your recipe. I just made homemade laundry detergent the other day and I love it so I will definitely be trying this one as well! Anything to help save some money! Baking soda, dump some in the toilet….followed by white vinegar. A good bathroom tile, tub, and toilet cleaner is mix 1/2 cup regular baking soda, 5 – 10 drops of tea tree oil or lavender oil, and enough liquid soap (hand soap is what I used, but you can use liquid dish washing detergent). Add enough liquid soap to make it the consistency of cake icing, mix well then store in air tight container. To use, simply apply to sink, tub, shower wall, or toilet and rub with wet cloth, then rinse well (you can use a toilet scrub brush on toilet). The first time I used this, my husband even noticed how clean, white, and sparkling his bathroom sink was! I wouldn’t recommend using this for counters since it would be a bit difficult to rinse off due to the liquid soap. And be sure to rinse VERY WELL after using in tub or shower – the liquid soap will make the shower/tub slippery if not thoroughly rinsed. I have been making my own laundry detergent! It has worked great and actually gets stains out compared to the store stuff! My daughter has bloody noses at least once or twice a month and it gets the blood out too! Whaaaaaaat? PLEASE share! I would love to make laundry soap that gets stains out! Thank you! I’ve considered making my own laundry detergent, as well as dish soap… this recipe seems so easy I don’t think I can pass up trying it!! 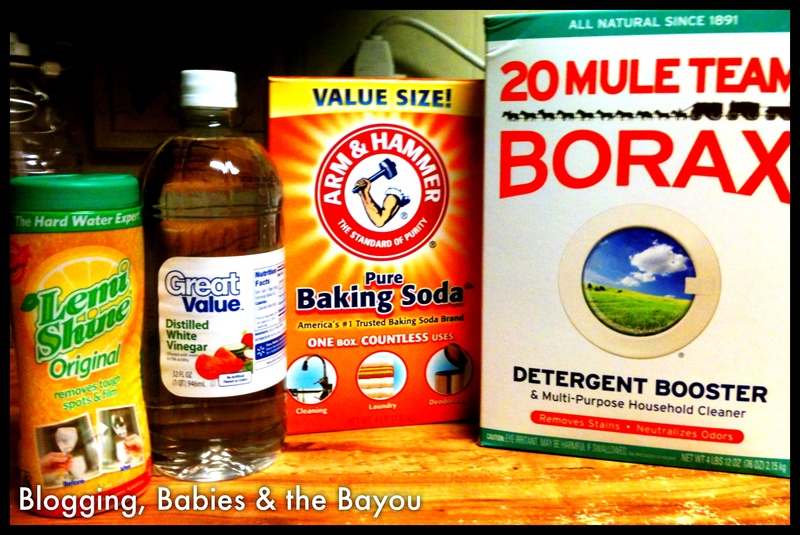 I use borax in every wash load – so I’d use it straight from the box…no recipe here. I would love to win this! Love Borax! I would love to make this dish washing detergent . thank you ! We are buying our first house, and it actually has a dishwasher! For the past 5 years we haven’t had one, so now dishwasher soap is something to add to my shopping list. I will certainly be trying this recipe! Thank you! 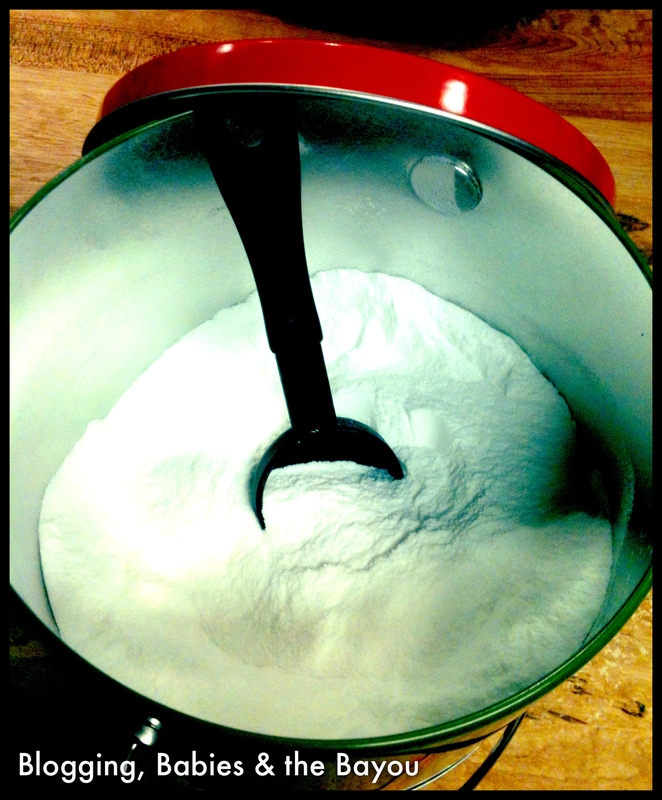 Thank you for helping us save money with your homemade recipe for dishwasher detergent! I look forward to a more “green” 2013! No dishwasher here but I’ll have to look into making laundry detergent. Wow! I love green alternatives. I don’t have a dishwasher but would love to try Borax for making laundry detergent. I use Borax in every load of laundry, but I never thought to use it in the dishwasher! I’d like to find a good alternative to harsh fabric softeners. This is awesome! Just shared on Pinterest. Well I love this “recipe” and I am mixing some up today. It’s great timing as I just ran out of my normal dishwasher detergent. I also would love to mix up some laundry soap and plan to do so soon because I’m just about to run out of that as well. GRACIAS,GRACIAS,GRACIAS!! I saved this recipe and am so excited to make my own dishwasher detergent! yahoo, going to share on twitter n pin it too! Thanks so much ! I got some Borax today and hope to find the Lemishine soon. I got mine at walmart in the dishwasher deterent aisle. It is near the dishwasher cleaner item section. Who would think to do their own dishwasher detergent? Not me!! Thank you for this DIY I need to try this stat!! P.S. You can do anything you set your mind to!! I’d like to try making homemade laundry detergent. It’s crazy how expensive laundry soap has gotten; and it seems I’m always running out of it! I made my own laundry soap this weekend. My lesson learned was that washing soda and borax will remove nonstick coating from a pan! I would LOVE to be blessed with free coupons! I’d love to continue making my own laundry detergent! I didn’t know this! Good to know! Thanks so much for posting how to make this detergent. I’ve made cleaning solutions and am very eager to try the detergent. I’ll be giving the dishwasher detergent a try to see how it does. Thanks! Will it build up or harm your dishwasher in any way? No, the LemiShine is actually made to help your dishwasher run more effectively. Hi, just found your recipe but living in Australia we don’t have lemishine, but arfter looking it up I found out that the main ingredient in lemishine is citric acid, so I just dumped a container of that in my detergent and it is working beautifully. Beautiful shiny glasses and silver wear! ( Im saving ALOT of money!!) I will have to see if my commissary has the ingredients!! Just wondering if anyone else had a problem with this turning into a brick? Mine is so hard that I have to have my DH drill it out for me….BUT, I might add here that this detergent was/is absolutely wonderful….apart from the “brick” problem…any suggestions will be awesome!! I do a load a day & I stir it up every time I use a serving. So it hasn’t clumped in my container. Do I need to use the citric acid stuff if my water is very soft? Just wondering. Forgive me if it says somewhere and I’ve missed it, but I have two areas for detergent in my dishwasher -where do you put your 2 Tbsp of homemade detergent? Do you suppose I should put the entire 2 Tbsp into the covered compartment (the main wash), or would I divide it between the two? Thanks for your response! LOVE Lemi-shine, btw! Been using that stuff for a couple of years now to keep my dishes free of that nasty film build up on my glassware. I put 1 table spoon in th detergent section and one I just throw inside the door. Just to let it fall freely. I just whipped up the dish detergent last night and was pleasantly surprised. no residue or spots. I did use just a little squirt od Dawn in the 2nd wash cup for the spot free shine. But you can’t beat 4 packets of lemonade kookaid for a buck. Thank you for sharing your recipe with me. I’ve come up with a cheaper, less harsh laundry soap that works well, my husband thought the felsnaptha soap was harsh, and it does make my eyes water when I grate it, anyway, I use 1 bar of ivory soap grated, 1 c. washing soda (arm and hammer) and 1/2 c. borax. I found a neat trick for grating the ivory soap, this may only work with ivory. Cut it into 3 pieces and microwave them separately for about 1 minute, more and less, watch it in the window. After a few seconds it will begin to grow, when it seems done expanding, take it out, let it cool and then chop with a chopper of any kind. It will quickly break up into powder, then stir the other ingredients into the soap. Use 2 T. per large load. No idea why the soap expands, it was a science experiment and I quickly realized this was a lot easier then grating the soap! I have been making my own Dishwashwer detergent for a while and I love it. My dishes come out really clean and shiny. This recipe is awesome. Thank you!! I’ve been using it for a few months and love it as well. Hi, the vinegar is the rinse aide. Just add a little to your rinse aide section instead of other brands like Jet Dry etc. it is cheaper & more effective. You can get a large gallon at Sam’s for the price of 1-2 small bottle of rinse aide. It is not a part f the dishwasher detergent recipe. Just an alternative & more economical. Ready to try, but one quick question…does it make a difference if you use washing soda instead of baking soda? I know they are pretty much the same thing, but I’m a literalist and need to verify everything! Thanks! Washing soda should be fine. I did not try it with it but I use it interchangeably as well. I was told years ago by a saleslady that using any dishwashing detergent with anything citrus was terrible on my stainless silverwear. I would love to try this but am afraid of the lemon in the recipe. Any thoughts? Lemishine is sold to boost your Dishwashers performance. That is it’s natural use. I added it to my recipe since it is already made for Dishwashers and also have the citric acid in it. Thanks for sharing this recipe. I already make my own laundry soap, and I already use vinegar for a rinse agent and as my “fabric softener” so as you can imagine I am pumped to make this my latest and greatest money saving project…( I also make my own body wash and face wash). I have three teenage daughters so making my own products have saved me as much as $65.00 month. Could you email me your recipe for body & face wash? I love to be frugal with 4 kids & a hubby. Thx in advance! I am confused, wouldn’t one batch only make 32 loads? Unless I’m doing my math wrong, 4 cups is 64 tablespoons and you would divide 64 in half because you use 2 tablespoons per load. I also added up how much it would cost except substitute baking soda for washing soda and I came up with roughly $30.74 for all the ingredients which would make about 3 batches then you would run out of washing soda or 4 batches until you run out of borax. It would come out to $10.25 for 1 batch. Or am I doing something way wrong? I just am trying to do the math and see it is a cheaper route to go or not. Every item I bought cost $11.02. You can make 5 batches for 11.02. Each batch makes 100 loads 100×5=500 loads. I created my 1st 100 loads (of the new product) Jan 1st 2013 and I’m still using it!! Hi there, I really want to try this recipe but all I can find is Lemon-Lime Kool-Aid…. Not sure about the variation. I would have to look at the ingredients in lemon-lime packet. I make my own bar soap, body butter, powdered laundry detergent and now, thanks to you, dishwasher soap! The savings is unbelievable AND I know what’s going on my skin, hair and dishes. My skin is no longer dry, I no longer have excema and mysterious breakouts on my face. Thanks for this great recipe for the dishwasher soap and the tips. Love the tip for dryer sheets. Love the tip on substituting citric acid for lemishine. I have used a similar recipe. But was wondering does your recipe have problem with clumping or hardening before you use it?? Mine has no clumps. I supposed it depends on the container you use? But I have heard adding a few grains of rice will deter clumping. Hi! I am new to making my own cleaners… I tried this recipe, mixed it in a plastic container and stored it under my sink next to the dishwasher… I just got it out to try it (it’s been a week since I made it, was using up the store bought) and it’s almost completely solid! What should I do now/in the future? Did you use lemishine or koolaid. I used the lemishine and wonder if that’s why mine has not clumped? Made some today and tried it after loading the dinner dishes. Works better than store-bought, in my opinion. Very pleased! Thank you for the recipe! You may have hard water and need to adjust your recipe. Borax acts as a buffer and raises the pH of water to soften it. Try to play with the recipe some. Vinegar acts as a shine agent so that shouldn’t be the issue for the rinse aid. Are you using washing soda or baking soda? If your recipe isn’t coming out right, add washing powder instead. I use my recipe as is and have no problem but I have my own well so I know the ph levels. Loving this recipe! Just mixed up my 2nd batch, a 1/2 batch since I’m low on baking soda. This stuff lasts forever and I’ve actually shared this with a couple people at the grocery store when they’re stumped looking at the options. Hai there, here a fan from the Netherlands. Thank you so much for this recipe. Made another recipe based on washing soda and eventualy it didn’t work so great. Used this twice now and it looks very promising. Making my house chemical free is really important to me (hubby and daughters know really call me “the witch”) but I am glad to have this good working recipe from you! Have a great DIY 2015 and kind regards from the dutch country side! i was just told by my dishwasher repairman that using vinegar in the dishwasher will break down any rubber gaskets or valves in the machine. Keep in mind when using wonderful white vinegar!! That’s great info from the serviceman repair. I wonder if regular dishwasher cleaning (like clean rinses) would mean cleaner rubber gaskets and such?